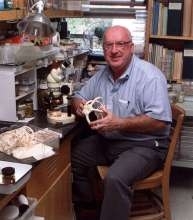 John H. Dearborn, Professor Emeritus in Marine Sciences, in his laboratory, 210 Murray Hall, University of Maine. Photo taken September, 1999. He is holding a specimen of Astrotoma agassizii, a large Antarctic brittle star. Sorg, M.H., J.H. Dearborn, E.I. Monahan, H.F. Ryan, K.G. Sweeney, and E. David. 1996. Forensic taphonomy in marine contexts. Pages 567 - 604 in W.D. Haglund and M.H. Sorg (eds. ), Forensic taphonomy. The postmortem fate of human remains. CRC Press, Boca Raton, Florida. Dearborn, J.H., K.C. Edwards and G. Hendler. 1996. The diet of Ophiosparte gigas (Echinodermata: Ophiuroidea) along the Antarctic Peninsula, with comments on its taxonomic status. Polar Biology, 16: 309 - 320, 6 figures. Ojeda, F.P. and J.H. Dearborn. 1991. Feeding ecology of benthic mobile predators: experimental analyses of their influence in rocky subtidal communities of the Gulf of Maine. Journal of Experimental Marine Biology and Ecology, 149: 13 - 44, 7 figures. Dearborn, J.H., K.C. Edwards and D.B. Fratt. 1991. Diet, feeding behavior, and surface morphology of the multi-armed Antarctic sea star Labidiaster annulatus (Echinodermata: Asteroidea). Marine Ecology Progress Series, 77: 65 - 84, 9 figures. Ojeda, F.P. and J.H. Dearborn. 1990. Diversity, abundance and spatial distribution of fishes and crustaceans in the rocky subtidal zone of the Gulf of Maine. Fishery Bulletin, 88(2): 403 - 410, 3 figures. Messing, C.G. and J.H. Dearborn. 1990. Marine flora and fauna of the Northeastern United States. Echinodermata: Crinoidea. NOAA Technical Report, National Marine Fisheries Service, 91, 30 pages, 18 figures. Ferrari, F.D., and J.H. Dearborn. 1989. A second examination of predation on pelagic copepods by the brittle star Astrotoma agassizii. Journal of Plankton Research, 11(6): 1315 - 1320. Ojeda, F.P. and J.H. Dearborn. 1989. Community structure of macroinvertebrates inhabiting the rocky subtidal zone in the Gulf of Maine: seasonal and bathymetric distribution. Marine Ecology-Progress Series, 57: 147 - 161, 6 figures. Dearborn, J.H. 1989. Benthic fauna. Pages 9 - 10 in L.B. Quetin and R.M. Ross (eds. ), The biological basis for area-wide protection at Palmer Station, Antarctica. Report of a Workshop held at the University of California at Santa Barbara, California on 3-4 November, 1988. U.S. Marine Mammal Commission (Contract No. T6223924-6). 59 pages. Dearborn, J.H., F.D. Ferrari and K.C. Edwards. 1986. Can pelagic aggregations cause benthic satiation? Feeding biology of the Antarctic brittle star Astrotoma agassizii (Echinodrmata: Ophiuroidea). Biology of the Antarctic Seas XVII, Antarctic Research Series, American Geophysical Union, Washington, D.C., Vol. 44: 1 - 28. Eakin, R.R., J.H. Dearborn and W.C. Townsend. 1986. Observations of marine birds in the South Atlantic Ocean in the late austral autumn. Biology of the Antarctic Seas XVII, Antarctic Research Series, American Geophysical Union, Washington, D.C., Vol. 44: 69 - 86. Akielaszek, J.J., J.R. Moring, S.R. Chapman and J.H. Dearborn. 1985. Experimental culture of young rainbow smelt Osmerus mordax. Transactions of the American Fisheries Society, 114: 596 - 603. 1985 Antarctic Journal of the U.S.
Dearborn, J.H. and K.C. Edwards. 1985 (1984 Review). Analysis of data on the feeding biology of Antarctic sea stars and brittle stars. Antarctic Journal of the U.S., 19(5): 138 - 139. 1984 Antarctic Journal of the U.S.
Dearborn, J.H., K.C. Edwards, D.B. Fratt and W.E. Zamer. 1984 (1983 Review). Echinoderm studies along the Antarctic Peninsula. Antarctic Journal of the U.S., 18(5): 193 - 194. Fratt, D.B. and J.H. Dearborn. 1984. Feeding biology of the Antarctic brittle star Ophionotus victoriae (Echinodermata: Ophiuroidea). Polar Biology, 3: 127 - 139. 1983 Antarctic Journal of the U.S.
Dearborn, J.H., L.E. Watling, K.C. Edwards, D.B. Fratt, and G.L. Hendler. 1983 (1982 Review). Echinoderm biology and general benthic collecting along the Antarctic Peninsula. Antarctic Journal of the U.S., 17(5): 162 - 164. 1983ta Antarctic Journal the U.S.
Kellogg, D.E., T.B. Kellogg, J.H. Dearborn, K.C. Edwards and D.B. Fratt. 1983 (1982 Review). Diatoms from ophiuroid stomach contents: implications for sediment reworking on the Antarctic continental shelf. Antarctic Journal of the U.S., 17(5): 167 - 169. Shick, J.M., K.C. Edwards and J.H. Dearborn. 1981. Physiological ecology of the deposit-feeding sea star Ctenodiscus crispatus: ciliated surfaces and animal-sediment interactions. Marine Ecology-Progress Series, 5: 165 - 184. Antarctic Journal of the U.S.
Dearborn, J.H., K.C. Edwards and D.B. Fratt. 1982 (1981 Review). Feeding biology of sea stars and brittle stars along the Antarctic Peninsula. Antarctic Journal of the U.S., 16(5): 136 - 137. Turner, R.L. and J.H. Dearborn. 1979. Organic and inorganic composition of post-metamorphic growth stages of Ophionotus hexactis (E.A. Smith) (Echinodermata: Ophiuroidea) during intraovarian incubation. Journal of Experimental Marine Biology and Ecology, 36: 41 - 51. Dearborn, J.H., H.H. DeWitt, J.D. McCleave, T.E. Targett, and E.F. Lowe. 1978. Benthic fishes and echinoderms in the Scotia Arc region. Antarctic Journal of the U.S., 13(4): 137 - 139. Dearborn, J.H. 1977. Foods and feeding characteristics of Antarctic asteroids and ophiuroids. Pages 293 - 326 in G.A. Llano (ed. ), Adaptations within Antarctic ecosystems. Proceedings of the Third SCAR Symposium on Antarctic Biology. Smithsonian Institution, Washington, D.C.
Dearborn, J.H., 1977. The brittle star (Ophiura robusta) in Maine and its relevance to the Critical Areas Program. A report prepared for the Critical Areas Program, Natural Resource Planning Division, Maine State Planning Office. Planning Rept. No. 50, 23 pp. 1977 Antarctic Journal of the U.S.
McCleave, J.D., J.H. Dearborn, and H.H. DeWitt. 1977. Ecology of benthic fishes and echinoderms along the Scotia Arc and the Antarctic Peninsula. Antarctic Journal of the U.S., 12(4): 19 - 20. 1976 Antarctic Journal of the U.S.
DeWitt, H.H., J.D. McCleave and J.H. Dearborn. 1976. 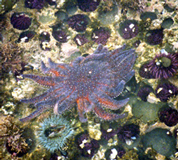 Ecological studies of fishes and echinoderms during ARA Islas Orcadas cruise 5. Antarctic Journal of the U.S., 11(2): 49 - 53. 1974 Antarctic Journal of the U.S.
Dearborn, J.H. and F.J. Fell. 1974. Ecology of echinoderms from the Antarctic Peninsula. Antarctic Journal of the U.S., 9(6): 304 - 306. 1973 Antarctic Journal of the U.S.
Dearborn, J.H., A.J. Jordan, S.M. Fried, H.T. King, and J.E. Miller. 1973. Ecological studies of echinoderms and general marine collecting along the Antarctic Peninsula. Antarctic Journal of the U.S., 8(4): 206 - 208. 1972 Antarctic Journal of the U.S.
Dearborn, J.H., K.W. Allen, J.-C. Hureau, and P,M, Arnaud, 1972. Ecological and taxonomic studies of echinoderms, mollusks, and fishes from the Antarctic Peninsula. Antarctic Journal of the U.S., 7(4): 80 - 82. Turner, R.L. and J.H. Dearborn. 1972. Skeletal morphology of the mud star, Ctenodiscus crispatus (Echinodermata: Asteroidea). Journal of Morphology, 138: 239 - 262. Dearborn, J.H. and D. Dean. 1970. Invertebrates from the Davis Strait and Labrador Sea. Antarctic Journal of the U.S., 5(5): 192. Dearborn, J.H. and J.A. Rommel. 1969. Crinoidea. In Distribution of selected groups of marine invertebrates in waters south of 35o S latitude. Folio 11, Antarctic Map Folio Series, American Geographical Society. Pages 35 - 36 and Plate No. 21. Dearborn, J.H., 1968. An unusual leap by a Pacific white-sided dolphin (Lagenorhynchus obliquidens). Journal of Mammalogy, 49: 328 - 329. Dearborn, J.H., 1967. Food and reproduction of Glyptonotus antarcticus (Crustacea: Isopoda) at McMurdo Sound, Antarctica. Transactions of the Royal Society of New Zealand (Zoology), 8(15): 163 - 168. Dearborn, J.H., 1967. Stanford University invertebrate studies in the Ross Sea, 1958-61: general account and station list. p. 31 - 47 In Bullivant, J.S. and J.H. Dearborn, 1967. The fauna of the Ross Sea. Part 5. General accounts, station lists, and benthic ecology. New Zealand Department of Scientific and Industrial Research Bulletin, 176: 77 pages. Dearborn, J.H., 1965. Ecological and faunistic investigations of the marine benthos at McMurdo Sound, Antarctica. Ph.D. Dissertation, Stanford University, Stanford, California; xiv + 238 p., illus. Dearborn, J.H., 1965. Reproduction in the nototheniid fish Trematomus bernacchii Boulenger at McMurdo Sound, Antarctica. Copeia 1965, No. 3: 302 - 308. Dearborn, J.H., 1965. Food of Weddell seals at McMurdo Sound, Antarctica. Journal of Mammalogy, 46: 37 - 43. Dearborn, J.H., 1962. An unusual occurrence of the leopard seal at McMurdo Sound, Antarctica. Journal of Mammalogy, 43: 273 - 275. Dearborn, J.H. 1957. A preliminary study of the food habits of the green crab, Carcinides maenas (L.) with particular reference to the soft-shell clam, Mya arenaria (L.). M.S. Thesis (unpubl. ), Michigan State University, 48 pages. Dearborn, J.H., 1957. Notes on the birds of Kitoi Bay, Afognak Island, Alaska. In Science in Alaska, Proc. Eighth Alaska Sci. Conf., Alaska Division, AAAS: 83 - 88.